I just made a little dough selling some stock I forgot I had. I am looking to buy a unique weapon. Practicality be damned! I was looking at a ps90 but don't find that to be too unique (especially around here) so now I am looking at a .50 Beowulf or a ksg. Pistol, rifle or shotgun; it just has to catch my interest and be close in price to those mentioned above. So, lets hear some suggestions! Thanks guys and gals! Money definitely is an issue. Dang jgreenburg, I didn't know you were such a bullpup fiend! I thought about the rfb but I recently bought a ptr-91 perimeter rifle. The Tavor is tempting but a bit more than I wanted to spend. I'm still leaning toward Beowulf at this point. You own a Beowulf? How do you like it? do not own just on the wish list, currently working on a 300 BLK pistol, stole the photo off the internet. Mister Freeze wrote: Sig p210. Pretty cool but not really what I was looking for. These are the kind of suggestions I am looking for though... Stuff I have to google search haha. Thanks freeze! nrv216 wrote: Money definitely is an issue. :thumb: Sweet baby jezzus yes. The gun that inspired the CZ75. I actually looked at the Grendel. Very cool cartridge but I feel like it only offers a little advantage over the .308 rifle I have. I would go ksg over Utas personally. Vector is interesting for sure but I am soured on the whole smg clone thing because of my inability to find/afford a decent mp5 clone. Seen it before but haven't seen anything about the range of that thing, I wouldn't think it would be that far though :skep: Anyone know? I already have a Grendel, seems only fitting that I get a Beowulf The thing is, I can't really 'justify' it other than I just want it. It's good for hogs ( which we don't really have in ID), and I don't want to destroy the exiting side for any kill I plan to keep (my '06 can already do a bang up job of that). The 'wulf's also good for engine blocks but I don't have a need to kill those either (unfortunately). Considered the .458 SOCOM - I like that you can use standard AR mags & the ballistics on it are better but with bullets this big and ranges within 200 yards, the differences aren't that substantial. 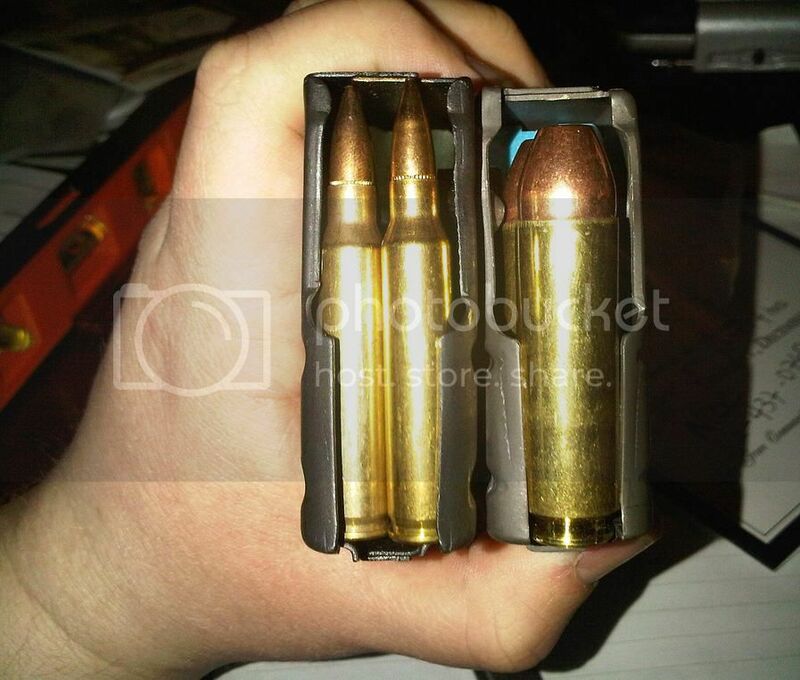 Ammo cost & availability is a factor.